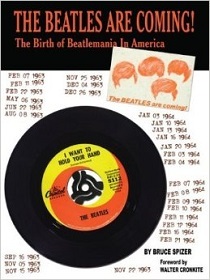 The kind of trivia that Bruce Spizer, author of The Beatles Are Coming!, is able to share never gets old. Doubly so when the 50th anniversary of the seminal New York trigger date (Feb. 7 1964) is looming. Spizer, for CBS New York and other network websites, today reframes the unlikely trio of Walter Cronkite, 15-year-old Maryland high school student Marsha Albert and D.C. radio DJ Carroll James Jr. A daisy-chain of events linked the three and helped speed the stateside spread of Beatlemania. 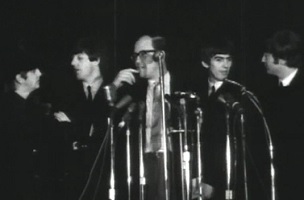 James, who had also seen the CBS Evening News [Cronkite] Beatles report, arranged to have a copy of their latest British hit single, “I Want To Hold Your Hand,” delivered to him by a flight attendant who worked for British airline BOAC. No Spotify; no iTunes; no email; no FedEx… Rather, a well-placed civilian was instrumental in helping someone like James Jr. engineer a quick pop culture crossover. Back to the present: It was Paul McCartney and Ringo Starr reunited on the Grammy stage last night and today, we have Spizer’s blog item. There will be plenty more Beatles nostalgia between now and a week from Friday. And if this trail manages to occasionally push Justin Bieber below the Web fold, even better.